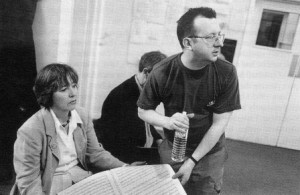 When I first met Mark-Anthony Turnage in November 1993, I had been aware of him and his music for a while. Perhaps I’d seen his photo, but I well remember almost knocking him down on a Highbury zebra crossing one day when I was driving my children to school. My curiosity was encouraged by a wonderfully unstuffy talk he gave (with Jonathan Moore, the director) about his opera Greek at an ENO studio event in January 1990, and a Channel 4 film in which he looked out of a train at an Essex landscape and talked about his childhood. Greek was staged at the Coliseum later that year. I bought a ticket and was hugely impressed: Turnage seemed to be one of a very few whose music had an individual voice which said something new, directly and communicatively. It could be startlingly intense, yet also touchingly lyrical and was certainly never self-consciously intellectual. At the November meeting we happened to be at the same dinner table at a formal awards ceremony. I was pleased to meet him and we prattled away about opera. Not long afterwards a slightly foxed first edition of Sean O’Casey’s great anti-war play The Silver Tassie came through my letter-box. Mark wanted my opinion on whether it would make an opera. In an empty week after Christmas I read the play several times and wrote a scenario. It hadn’t occured to me that this distinguished composer would invite me to write a libretto, but when he did a dream came true. I had no doubts about my theoretical qualifications for the job, having grown up with opera in its broadest sense. Though my first loves were musicals, I accompanied my culture-loving parents to Covent Garden, Glyndebourne, D’Oyly Carte, Sadler’s Wells and even Paris, Verona and Salzburg before I was a teenager. My Oxford grandmother filled in the gaps with Christmas pantos and Handel in Abingdon. With my opinions yet unformed, I was baffled and bored by works in foreign languages, but I loved playing, singing and trying to work out how music dramas were put together. I knew nothing of contemporary music but sang and played my way through the classics at school and university, where I ran the Opera Club and commissioned a new work, encouraged by my tutor Egon Wellesz – a Schoenberg pupil, who had written one of his operas to a libretto by Hofmannsthal. My stage experience only stretched to Salad Days and the chorus of The Rake’s Progress (The Times critic said he had never seen such genteel whores); later, as an accompanying student at the Guildhall School in London, I was paid £1 for each four-hour session willingly spent playing the piano for their formidable voice teachers. Since 1985 I had gradually given up teaching and performing as I had found myself constantly translating libretti for opera productions. Having completed about twenty of these, I longed to write a libretto myself. Perhaps Turnage thought that I might know how operas worked and how they didn’t. After all, a libretto is not a play or a book, and though the words are the starting point, they must leave space for the music to flesh out the characters and the drama. It was reassuring to glance at an index of librettists and see only a few household names; a good librettist is not necessarily a famous writer, but a musically literate one who knows which words will `sing’ and `go over’ clearly. The drama must be skeletal, yet anatomically secure and fluent. O’Casey’s play seemed to me to be a perfect vehicle for a sung drama. In the summer of 1994, I saw a production of The Silver Tassie at the Almeida Theatre and felt even more excited about the opera. Where the play is long, I could easily start to fashion the opera by omitting the lengthy comic episodes without losing the essentially tragi-comic flavour and main characters. The story of a young man who volunteers for military service and goes idealistically off only to have his life shattered is far from comic, but the situations often are, albeit in an ironic way. The play is also much bigger than the sum of its parts: it has a universal resonance. The Silver Tassie was a watershed for O’Casey. Famously, W.B.Yeats and the Abbey Theatre in Dublin, the scene of O’Casey’s triumphs, rejected the play. This changed his relationship with his homeland for ever and he barely set foot there again. George Bernard Shaw leapt to his defence – he wrote in 1928: `There is a new drama rising from the unplumbed depths to sweep the nice little bourgeois efforts of myself and my contemporaries into the dustbin’ – and the play was premiered in London. The young man in The Silver Tassie is Harry Heegan, a hero who can do no wrong. The only child of aging parents, he lives with them in a tiny apartment at close quarters with Susie, the girl-next-door who hero-worships him, and the couple upstairs, the slightly flighty Mrs Foran and her brutish husband Teddy, who are always quarrelling. Act I opens with parents and neighbours preparing for Harry and Teddy (who are on leave) to return to the war. Harry eventually arrives in triumph, with his glamorous girlfriend Jessie and his best friend Barney, brandishing a silver trophy, the `tassie’ of the title, won for scoring the deciding goal for his football team, and immediately leaves for the front with Teddy and Barney. Act II takes place at the front. A chorus of squaddies endure the squallor of life at war, interrupted by barking officers, a trail of stretcher-bearers and a strange ghostly figure who misquotes the famous `dry bones’ passage from Ezekiel. A frenetic game, inspired by a football in a parcel that comes from one of the soldier’s girlfriends with a note – `to play your way to the enemy trenches when you all go over the top’, is interrupted by an enemy attack. Act III returns to Blighty and a hospital ward. Harry is in a wheelchair, tended by Susie who has volunteered as a nurse and is flirting with the overworked doctor. When parents and the Forans visit, we realise that Teddy is also wounded – he is blind – and that Barney has been awarded the VC for saving Harry’s life. Only at the start of act IV is it apparent that Harry won’t walk again (an operation has failed) and against the background of a garish dance for soldiers on leave (who will return to the front…) Harry watches Jessie fall into the arms of Barney. The four acts immediately suggested a classically symphonic symmetry to me: the first setting up the drama and the second, a `slow’ movement, at the war; the third would be a kind of scherzo macabre and the finale a dance. To keep the momentum going within a show of a maximum of two hours’ music, I suggested that acts I and II, as well as III and IV could be linked by orchestral `War’ interludes. Furthermore, since opera rides happily over any narrative’s logical pedantry, I hoped to further the momentum by suggesting an operatic time-scale of October, November, December and January for the four acts entitled, Home, War, Hospital and Dance. This fits nicely into a wintry scenario giving just enough space for the main characters to develop significantly, while the lesser characters (just as significantly) do not. After the huge success of the `Irish’ plays (The Shadow of a Gunman, 1923, Juno and the Paycock, 1924, and The Plough and the Stars, 1926) it seems that O’Casey was ready to go in a completely different direction. He himself thought The Silver Tassie the best work he had yet done. It casts its net more widely than the earlier, more veristic masterpieces, possibly because, though he thought about the play in Dublin, he actually wrote it all in central London (in 1928). Only the first act looks back over its shoulder at a dysfunctional society (reminiscent of Juno and the Paycock), while the last two have something of the fantasy which colours his next play, Within the Gates (set in Hyde Park) and other subsequent works. It is perfect operatic material. The second act is in a deliberately expressionist style, and O’Casey’s son (born when his father had just received that devastating letter from Yeats) confirmed to me that his father always regarded this play as operatic, having filled it with songs (he used to drive the family quite nuts, continually singing and chanting around the house). Indeed, the title comes from a traditional Scottish song with words by Robert Burns which appears in act I: `Gae bring to me a pint of wine and fill it in a silver tassie…’. Though it seemed perfectly logical to set the opera somewhere in the Britain (or Blighty) of the First World War, it could happen anywhere at any time. Where the language of the first act is Irish, the second (including `We’re ere because we’re ere because we’re ere…) is English, cockney and army-proper; it doesn’t seem any more rooted in Ireland than All Quiet on the Western Front by Erich Remarque (1929) is in Germany or, indeed, The Marriage of Figaro (original play by Beaumarchais) is in France. With time on our side (and a premiere pencilled in for 1998) I drafted the libretto over the following two years (1994-96), first typing out the whole play to get it into my system. It is about 24,000 words long. The longest libretto I know (Figaro) is about 12,000 words whereas Handel’s tend towards the economical (Alcina is 5,000 at the most). I cut out a major character, Simon, who is Harry’s father’s crony, like Joxer in Juno and the Paycock. The rich dialogue between them seemed wrong for the opera. And I stripped away all non-operatic phrases and words, keeping only those that clearly defined the characters and the plot (the final length weighed in at a pleasing 7,000 words). I also decided early on that act II, in which no principal characters appear, must be set for male voices only – it would be a great opportunity for the ENO mens’ chorus – and moved the football game to the penultimate moment so that the climax, when the enemy attacks, would come darkly out of the temporary euphoria of the game. Only when the short score was finished did the composer decide to give the stretcher bearers’ song, as they wearily carry the wounded to be tended, to a group of trebles. He had realised that he needed a different colour and told me that he hoped the addition wouldn’t `make it sound too BB’. It is not made explicit in act two that the hero has been wounded, the real horror descends after the interval. And to rub salt in the wounds, the last act takes place at a dance, where we discover that Harry will never walk (`nor run nor dance’) again. There would have to be dance music throughout that act. Close to Armistice day in November 1996 I completed the draft and sent it to the composer, who was working on a different operatic project for ENO by then. The future of the work hung in the balance until one day in September 1997, when Turnage appeared on the doorstep with the first few pages of act I, scene 1 in short score. The interesting work had suddenly begun. With the composer’s studio only 100 yards from my house it was easy to evolve an ideal collaborative system. After discussing a scene in detail I would adjust it, underlining words which might usefully be stressed or repeated. He would bring round a few pages at a time and I would go through them immediately, by which time he would already be on to the next section. But he was always willing to consider my comments and would either dismiss them or go back over anything that wasn’t clear; I never doubted his vision of the piece, even if I occasionally felt uneasy about my words being disturbed. When the first act was complete in short score (and he was orchestrating it), Mark asked if we might go through it with a pianist. I set up some sessions with Henry Ward, a friend and colleague with vast experience of contemporary opera (he was the repetiteur for the original production of Owen Wingrave). Mark adjusted the score during and after the hours spent around my piano with Henry singing and playing; it was riveting to hear the work taking shape `live’. While the composition continued the finished sections were work-shopped with singers and piano at the ENO Studio. Hearing the work sung at such an early stage was a total luxury and I was constantly astonished by the skilful way ENO’s music staff and singers could learn a few scenes in a few days. Finally there were also orchestral workshops by which time I felt my task was over; they principally provided the composer with opportunities to make further adjustments. The whole process spread over nearly two years, with great bursts of activity followed by substantial breaks for the rest of life to intervene. It was fascinating to watch the composition of the work so closely, from the one dimensional words right through to the glorious 3D of the full orchestra. And it was great to feel, as librettist, drawn into the genesis of that work and put on the spot by writing revisions almost on that spot: to add a verse when a song seemed too short; to write an aria in response to an early morning phone call and deliver it before noon only to find the music on the doormat that evening; to sit up into the early hours writing a duet and deliver it to the studio’s doormat just in time for the composer’s dawn start; and finally to know that there were times when the music came flowing so fast that Turnage could set his own sketched additions to the words and allow me to improve on them afterwards (opera translating experience came in handy). I will always remember how interesting it was to witness a great composer’s extraordinary creative energy at first hand, and his dramatic skill in lifting words into realms I had never imagined. Perhaps I won’t listen to any opera in quite the same way ever again.